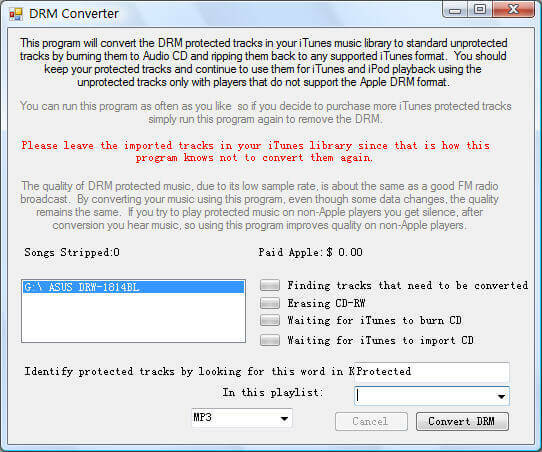 DRM Converter for Windows 1.00 Free Download - The legal way to convert iTunes DRM protected files to unprotected music files. The legal way to convert iTunes DRM protected M4P files to unprotected MP3 files at high speed and with CD quality. It is perfect DRM removal tool designed for remove Drm protection from iTunes M4P files through burning DRM protected music to a virtual CD-RW disc and then automatically rip/encode the music stored on the Virtual CD-R. This makes the whole conversion process automatically and faster. Statement: First, please download the orginal installation package by clicking the download link. Of course you may also download it from the publisher's website. Using DRM Converter for Windows crack, key, patch, serial number, registration code, keygen is illegal. The download file hosted at publisher website. We do not provide any download link points to Rapidshare, Hotfile, Depositfiles, Mediafire, Filefactory, etc. or obtained from file sharing programs such as Limewire, Kazaa, Imesh, Ares, BearShare, BitTorrent, WinMX etc. Software piracy is theft. If you like DRM Converter for Windows please buy it.